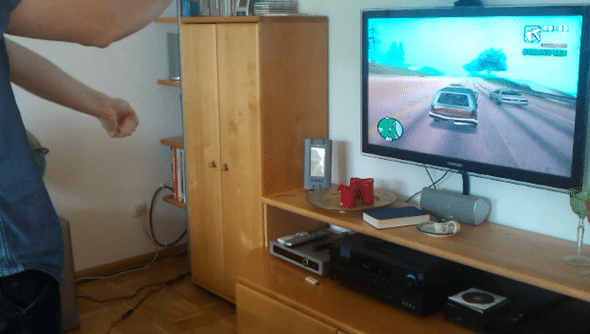 With an application called KinDriver, you can play GTA: San Andreas on your PC using Microsoft motion camera kinect. This application has Speech-Recognition, as pointed out by the developer who coded this on his blog. KinDriver has a Speech-Recognition feature too, so you can enable/disable tracking or execute the special-command. For the moment I will release the current KinDriver version which is designed for use with GTA (San Andreas). I will add extended SR features (meaning you can edit the commands), but I won’t promise any dates at this point. If you’re intrested in doing this you’ll first need x86 versions of these: .NET Framework 4, Microsoft Speech Platform – Software Development Kit, Microsoft Speech Platform – Server Runtime, Kinect for Windows Runtime Language Pack. And Microsoft’s own Kinect SDK for Windows which can be obtained from here, and make sure you get the x86 version. As you can see from the videos embedded below, this application doesn’t respond quite well, but we hope that the developer fix this the bugs later on or even perhaps code this application for Grand Theft Auto 4.